Luigi has a quite simple model for execution and triggering. The most important aspect is that no execution is transferred. When you run a Luigi workflow, the worker schedules all tasks, and also executes the tasks within the process. The benefit of this scheme is that it’s super easy to debug since all execution takes place in the process. It also makes deployment a non-event. 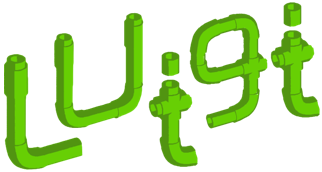 During development, you typically run the Luigi workflow from the command line, whereas when you deploy it, you can trigger it using crontab or any other scheduler. The downside is that Luigi doesn’t give you scalability for free. In practice this is not a problem until you start running thousands of tasks. Isn’t the point of Luigi to automate and schedule these workflows? To some extent. Luigi helps you encode the dependencies of tasks and build up chains. 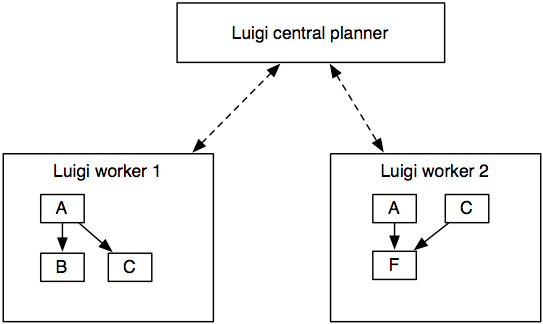 Furthermore, Luigi’s scheduler makes sure that there’s a centralized view of the dependency graph and that the same job will not be executed by multiple workers simultaneously. A client only starts the run() method of a task when the single-threaded central scheduler has permitted it. Since the number of tasks is usually very small (in comparision with the petabytes of data one task is processing), we can afford the convenience of a simple centralised server. The gif is from this presentation, which is about the client and server interaction. Luigi does not include its own triggering, so you have to rely on an external scheduler such as crontab to actually trigger the workflows. In practice, it’s not a big hurdle because Luigi avoids all the mess typically caused by it. Scheduling a complex workflow is fairly trivial using eg. crontab. In the future, Luigi might implement its own triggering. The dependency on crontab (or any external triggering mechanism) is a bit awkward and it would be nice to avoid. For instance, if you have an external data dump that arrives every day and that your workflow depends on it, you write a workflow that depends on this data dump. Crontab can then trigger this workflow every minute to check if the data has arrived. If it has, it will run the full dependency graph. You can trigger this as much as you want from crontab, and even across multiple machines, because the central scheduler will make sure at most one of each AggregationTask task is run simultaneously. Note that this might actually mean multiple tasks can be run because there are instances with different parameters, and this can give you some form of parallelization (eg. AggregationTask(2013-01-09) might run in parallel with AggregationTask(2013-01-08)). Of course, some Task types (eg. HadoopJobTask) can transfer execution to other places, but this is up to each Task to define.